Walleye Cards, LLC: Note Cards by Wildlife Biologist & Artist in Leavenworth, Washington! Hi and welcome to a peek into nature via watercolors and field journals. Please read on about Walleye Cards, LLC, Sketchbook Memories, the stores where they are available, as well as my field journal entries. Heather is a Pacific Northwest notecard artist, watercolorist, nature writer and wildlife biologist. She holds a Bachelor of Science degree from the University of Washington in Wildlife Habitat Management; and a Forest Technology degree from Wenatchee Valley College. While studying the sciences, she took drawing courses at WVC and UW. Focused on watercolor Heather was mentored by Los Angeles painter, Barbara Kerwin and New Zealand artist David Barker. Walleye Cards, LLC and Wildtales Journals, Heather’s naturalist notecard and journal business, was founded in 1997. Her small independent business donates over 10% of sales to conservation and arts organizations. 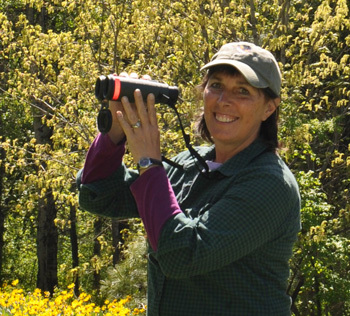 Retired from the U.S. Forest Service as a wildlife biologist; Heather’s career spanned from 1974 to 2005. She is currently a nature journal instructor and a consulting wildlife biologist. She continues to lead Citizen Science programs as a volunteer for the U.S.F.S. Heather presented "Wildlife and Art of National Forests" to the Smithsonian Institution's 2005 Folklife Festival in Washington D.C. In the autumn 2007, she was the Artist-In-Residence for the North Cascades National Park at Stehekin WA. She has offered nature journaling workshops for adults and students throughout the Pacific Northwest; as well through her travels to Mexico’s Yucatan Peninsula; the American School in Paris; and the Lochaber Natural History Society in the Scottish Highlands. During 2014 Heather participated in Swarovski Optiks initial Birding Tour of Austria. 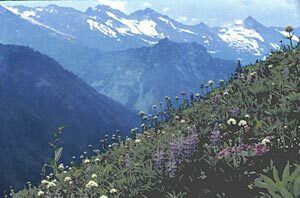 Heather presented "Wildlife and Art of National Forests" to the Smithsonian Institution's 2005 Folklife Festival in Washington D.C. She was the Artist-In-Residence for the North Cascades National Park in 2007. She has offered nature journaling workshops for adults and students throughout the Pacific Northwest; as well through her travels to Mexico’s Yucatan Peninsula; the American School in Paris; and the Scottish Highlands. During 2014 Heather participated in Swarovski Optiks initial Birding Tour of Austria. Special North Central Washington projects which Heather helped co-found are: ¡Team Naturaleza! (connecting Latino communities with natural science education); and Dancing With Birds a collaborative science and art project spotlighting migratory birds in the Western Hemisphere. Both programs connect people with migratory birds in the Western Hemisphere. The organizations are partnered with International Migratory Bird Day. "Influenced by the early explorer-scientists of America's West, I mix natural history notes with watercolor field observations. The blending of science and art is intriguing to me both as a wildlife biologist and as an artist- painter. "Traveling through wildlands across the world, I keep sketchbook memories of sights, sounds and smells; journaling, capturing the ‘sense of place'. It is enriching to learn about the uniqueness of an area through landforms, vegetation and wild things. My maiden name is "Wallis". While growing up as the youngest of the 5 "Wallis Girls", we were often called the "Walleye's". I used to make homemade cards when I was a kid, "Walleye Cards" was the logo I used then. Walleye is also a fish, native to lakes in the eastern part of North America. Thus the name "Walleye Cards" both honors my family and appeals to the wildlife biologist in me. Wildtales, my registered website name since 1998, comes from my vision of recording stories from the wild. Be on the lookout for notecards, journals, stories, and books to come from Wildtales.com over the years. My note cards are reproduced directly out of my field journal/sketchbook, which shows the spiral binder as a part of the card. This process is copyright protected.